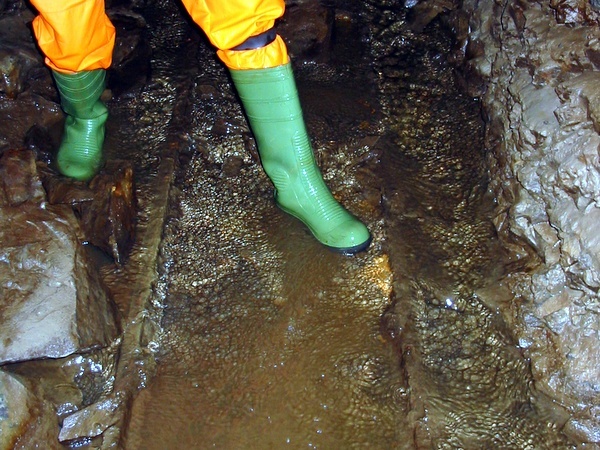 The level was started at an altitude of 181 m, about 10 m above the floor of Hebden Gill. This allowed the spoil to be directly trucked out of the level and tipped down the bank. A railway line with a 19" guage was laid into the level, and the spoil from the face loaded into wagons and removed by horse. The spoil heap is now known as Smithy Hill, as the village blacksmith was to later built his workshop on it. A piece of the old track may be found half-buried in the bank above the entrance. 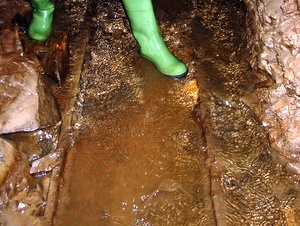 Much of the track is still in situ in the level, but is usually buried under silt. In places, track was also used as a footing for the lining wall. 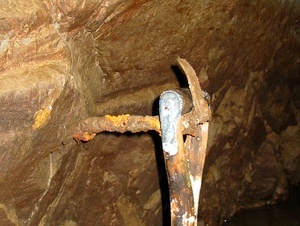 Compressed air drills were used to speed up the digging. These were originally patented by Joseph Fowle in the United States in 1851, and were at least five times faster than drilling by hand. In addition, the exhaust air aided ventilation, albeit at the cost of increased dust, and requiring considerable capital investment. The air compressor was powered by a 36' diameter waterwheel - the remains of the pit may still be seen below Smithy Hill. In the level itself, 30 cm long iron brackets hammered into the south-east wall were used to support the air pipes. 1¼" shot holes to a depth of 18" were drilled, and 4" long dynamite cartridges inserted. A percussion cap was placed over the cartridge, and tamped with mud, and this was fired using a slow-burning fuse. Dynamite was patented in 1867 by Alfred Nobel, which together with the use of compressed air drills, indicates that the latest technology was being employed. In general, the level was intended to be seven feet high and six feet wide, but it varied according to the stability of the ground. The level passes through the North Craven Fault, and much of the first 200 metres or so is lined, presumably because it passes through unstable ground. Most of the rest of the currently accessible level is in pretty stable rock, although there are areas of slabby mudstones which are propped with timber, and the last fifty metres are positively unstable. 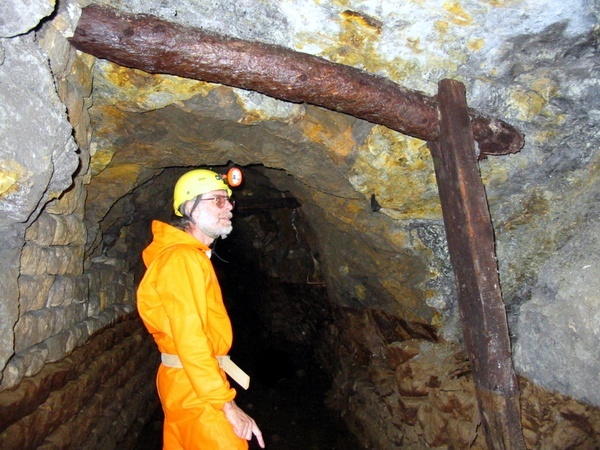 In 1881 there were eleven underground staff employed by the company. If, as is maintained by the contemporary account, there were three shifts this indicates about four people on a team. The same account suggests that two of these would be working at the forehead, implying a couple disposing of the spoil and carrying out other necessary operations. Because of the distances involved, it became necessary to improve the ventilation, and an air shaft was dug above Copper Gill on the far side of Backstone Edge Lane at SE 03571 63733. Few signs of it now remain. It is thought that an 8' compressor wheel was installed upstream of the air shaft to force air through pipes to the forehead to improve ventilation. Whether this was used to boost the compression of air arriving from the portal to allow the compressed air drills to ventilate the forehead, or whether compressed air drilling was abandoned, and the wheel used to force air to the forehead just for ventilation is unknown. Photograph to show a lined section of the adit taken in 2006.